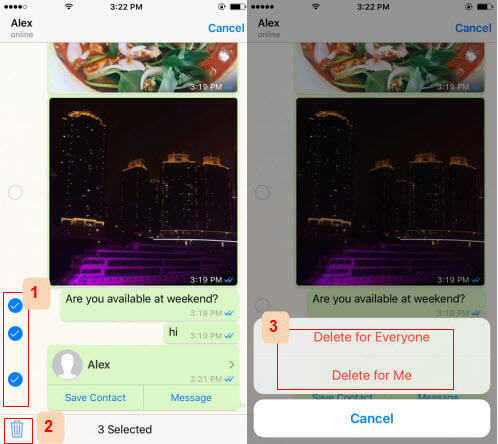 How to Delete WhatsApp Data on iPhone? Whatsapp has surely become quite a popular app among smartphone users. Almost every user ever day has conversations on Whatsapp nowadays. In fact, it is not just messages that are being communicated. Pictures, videos and other types of files are increasingly being shared on this platform. Although Whatsapp is an amazing app, it is however important to note that the conversations we have accumulate over time in our iPhone’s memory. This may lead to poor performance of your phone and is also dangerous in terms of putting your privacy at risk. There is no telling as to when some hacker hacks your device and accesses all your private messages. Therefore, here are some of the methods that you can use to delete Whatsapp data from iPhone. Step 1: Launch WhatsApp and enter the chat window containing the message you want to delete. Step 2: Then tap and hold message until some options appear. Step 3: Tap the "More" button and click "Delete". Step 4: Select multiple messages and click "Trash" icon. Step 5: Confirm it by click "Delete". If the messages you want to delete were sent by you, you can tap "Delete for Everyone" which will also delete the messages from the recipient's device. Note The WhatsApp messages or chats that you manually delete from iPhone are just removed from your iPhone storage but not from device drive. That means the deleted files are easy to recover with the right tool. For privacy protection, you need to permanently ease WhatsApp data and make them 100% unrecoverable. iMyFone Umate Pro is an iPhone data eraser that can permanently delete iPhone data without leaving any trace of deleted files. It's the first eraser that supports third-party apps data, including WhatsApp, Viber, LINE, Kik, WeChat, etc. 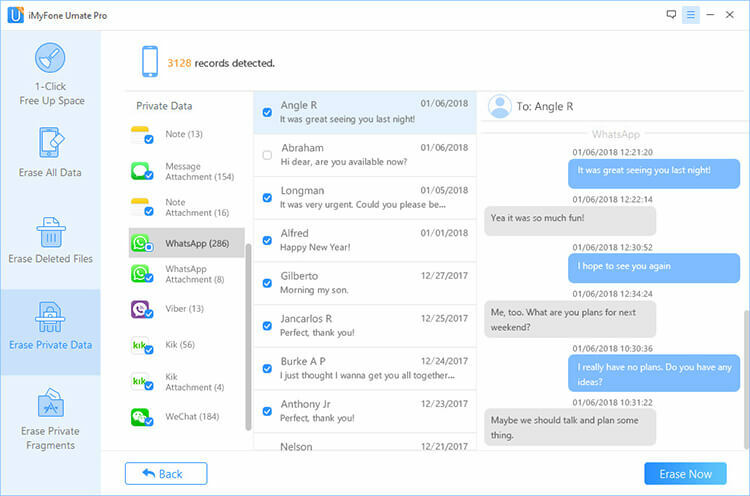 Erase Private Data: Preview WhatsApp messages, photos and videos and select data to completely erase, which is 100% unrecoverable. Erase Deleted Files: Scan and erase the previously deleted files which are still recoverable. Erase Private Fragments: Private traces left by third-party apps will be thoroughly cleaned from iPhone. 1 click clear up WhatsApp cache and other app junk files at once. Step 1: Launch iMyFone and connect your device to the computer. Step 2: Click on the “Erase Private Files” option. iMyFone will start scanning your device. Step 3: Once scanned, all your private files will be displayed. Select the WhatsApp messages option and select the ones you think are private. Step 4: Click “Erase Now”. Type in “delete” to confirm and click “Erase Now” again. 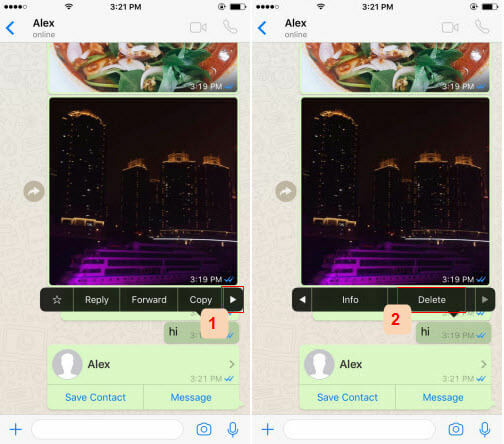 With iMyFone Umate Pro,your WhatsApp messages, attached photos, attached videos or just some fragments can be removed from the iPhone permanently, no tool can recover them. With all the discussion regarding how to delete Whatsapp data, you must be wondering as to why it is so important to delete them in the first place. As mentioned earlier, it is a privacy risk to have sensitive conversations lying in your phone’s memory. What if you had a confidential business discussion with your manager only to find out the messages were accessed by some hacker the next day? Such incidents are not uncommon and it is therefore vital that you delete these conversations as soon as possible. Besides, a lot of messages stored on your phone can interfere with your phone’s performance and as such slow it down.